I used to buy some kind of a tech gadget for my birthday ever since I had started earning. But this time, it didn't happen. That's because I bought it a month and a half in advance. It's a Google Pixel 2. 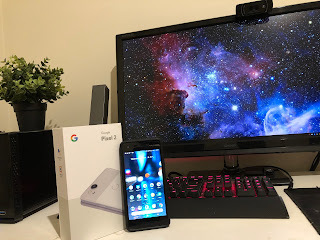 That's my 2nd phone purchase since moving to Australia. I got it from Telstra on a $59 per month plan with 15GB free monthly data allowance. That alone is a good deal, but I got $100 gift card from JB HiFi and a Google Home Mini (which I will write about later) with it. I was upgrading my phone from a Samsung Galaxy S7, which had become very sluggish for no apparent reason. I was paying $65 per month for it with only 7GB monthly data, so this is a good deal. I got the White one. But I got a black case for it so the white body hardly reveals anymore. I loved the Spigen case that I had on the S7, so I had no reason to look for another brand. This new case has a sturdier kickstand than the old one. While the Pixel 2 is a newer phone, it lacks so many features not only comparing with phones from competitors that were released around the same time but also the S7. Tapping the fingerprint sensor takes me into the phone. With S7, you need to "press" the home button. So it doesn't feel like an upgrade across the board, but I give a larger weight to the snappiness of the phone, so it definitely is a worthy upgrade for me. Other than those deficiencies over the S7, I have experienced few things that I have never experienced on the S7. But these things don't happen often, so I am not infuriated by it... yet.